The Daily Mail might not have picked up on it quite yet, but 2005 looks like being the year of quirky Californian rap. 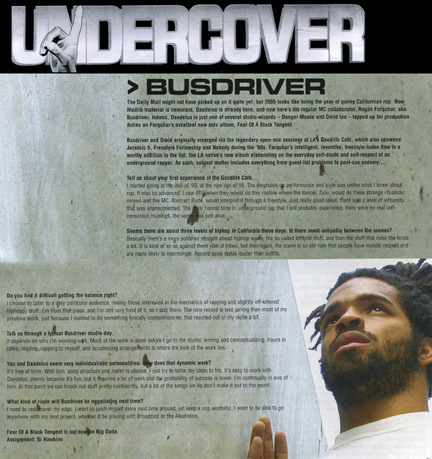 New Madlib material is imminent, Daedelus is already here, and now here's his regular MC collaborator, Regan Farquhar, aka Busdriver. Indeed, Daedelus is just one of several studio wizards - Danger Mouse and Omid too - tapped up for production duties of Farquhar's excellent new solo album. 'Fear of a Black Tangent'. I started going at the end of '93, at the ripe age of 15. The emphasis on performance and style was unlike what I knew about rap. It was so advanced. I saw ATU when they would do this routine where the dancer, Zulu would do these strange ritualistic moves and the MC, Abstract Rude, would interpret it through a freestyle. Just really good ideas, there was a level of virtuosity that was unprecedented. The most honest time in underground rap that I will probably experience, there were no real self-conscious, musings, the scene was just alive. Seems there are about three levels of hiphop in California these days. Is there much antipathy between the seems? Basically there's a more polished straight-ahead hiphop scene, the so-called leftfield stuff, and then the stuff that rides the fence a bit. It is kind an us against them vibe at times, but then again, the scene is so old now that people have mutual respect and are more likely to intermingle. Record sales speak louder than outfits. Do you find it difficult getting the balance right? I choose to cater to a very particular audience, mainly those interested in the mechanics of rapping and slightly off-kiltered hiphoppy stuff. I'm from that place, and I'm still very fond of it, so I stay there. The new record is less jarring then most of my previous work, just because I wanted to do something lyrically comprehensive, that reached out of my niche a bit. Talk us through a typical Busdriver studio day. It depends on who I'm working with. Most of the work is done before I go into the studio, writing and conceptualizing. Hours in cafes, reading, rapping to myself, and scrutinizing arrangements is where the bulk of the work lies. You and Daedelus seem very individualistic personalities. How does that dynamic work? It's free of form. With him, song structure and meter is elusive, I just try to tailor my ideas to his. It's easy to work with Daedelus, merely because it's fun, but it requires a lot of work and the probability of success is lower. I'm continually in awe of him. At this point we can knock out stuff pretty confidently, but a lot of the songs we do don't make it out to the world. What kind of route will Busdriver be negotiating next time? I need to rediscover my edge. I want to push myself more next time around, yet keep a pop aesthetic. I want to be able to go anywhere with my next project, whether it be playing with Broadcast or the Alkaholiks.